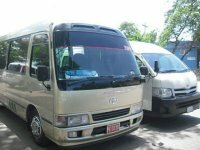 After docking our fully air-conditioned vehicle will pick you up for a trip through the historical town of Falmouth for a view of famous Georgian style houses, drive along the north coast to the famous Columbus park, site of Christopher Columbus first landing on Jamaica's shores for a very informative history lesson. 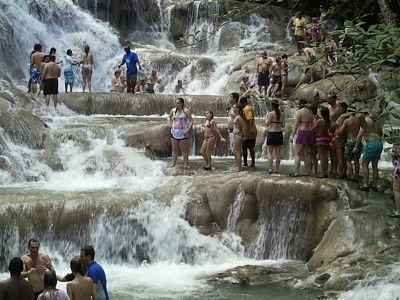 Your next stop will be Jamaica's world famous Dunn's River Falls; this cascading 600 ft. waterfall flowing into the Caribbean sea, bask in the falls refreshing natural pools while climbing, after the climb relax on the beach or take a swim before heading back to your cruise, with time to spare grab a bite at the famous Scotchie's Jerk Center in Ocho Rios for a taste of Jerk Chicken, Jerk Pork and some festivals for the road. Round trip transfer between Falmouth cruise ship pier and Ocho Rios. View historic buildings in Falmouth Town. Stop at Columbus Park and where Columbus landed in Jamaica. 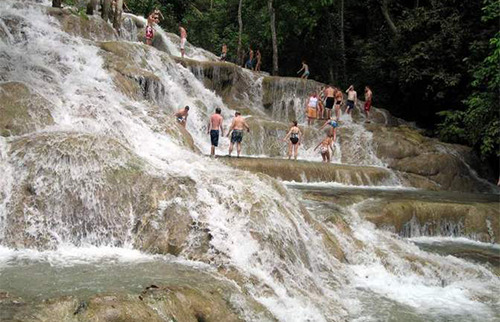 Dunn's River Falls & guide entrance fee. Ocho Rios Shopping, Margaritaville & Craft Market. Ocho Rios Sightseeing town tour.